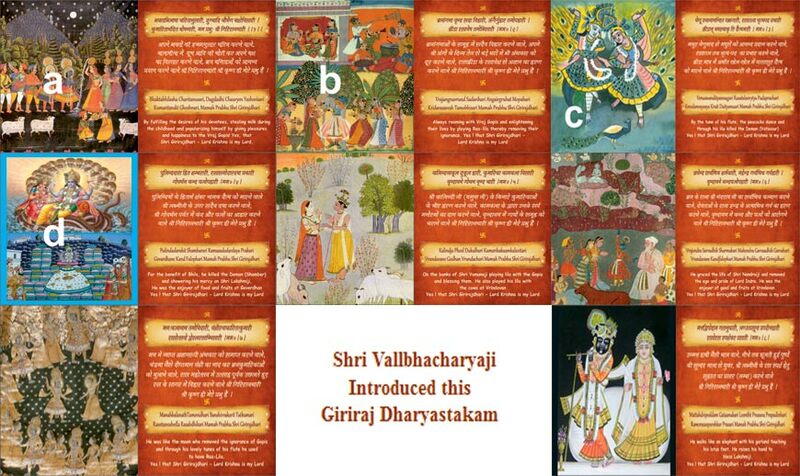 Shri Girirajji is acknowledged through the vedic scripture's as the most sacred in the whole of India. The vedas also say , that Girirajji is non-different from the Supreme Personality Lord Shrinathji. Shri Girirajji should be envisioned to be in the shape of a peacock resting with its head tucked into its side. It's face is considered to be Kusuma - Sarovara, its neck Mansi-Ganga, its mouth Mukharavinda, its two eyes Radha-Kunda and Syama-Kunda, the beginning of its tail Balarama Sthali and the end Punchari-Kunda (Naval-Kunda). Shri Girirajji has a parikrama of about fourteen miles (23Kms) and can take five to six hours to complete if one walks a brisk pace. 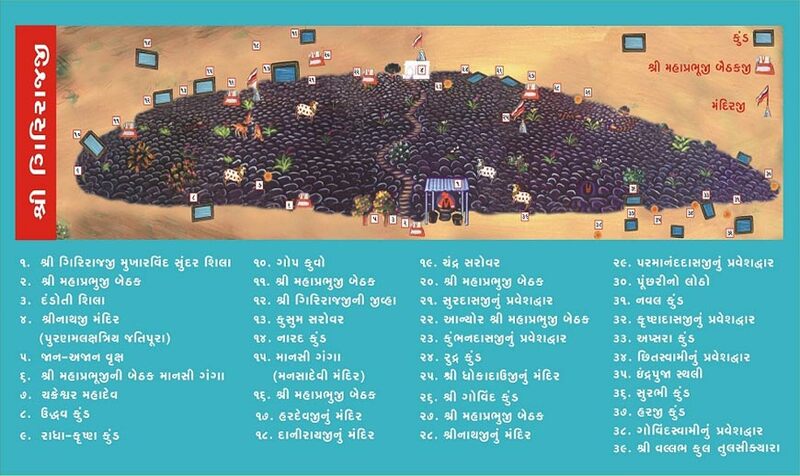 People from all over India visit Vraj in order to perform parikrama. On auspicious occasions like Guru-Purnima, Purshottama-masa or Goverdhana -Puja, over half a million people go around the sacred hill. There is no time limit for performing parikrama, for those who perform the dandavat parikrama it may take weeks and sometimes even months to complete. 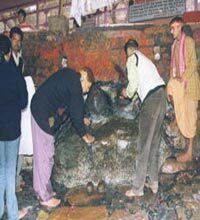 The dandavat parikrama is performed by standing in one spot, offering obeisances like a stick, again marking the spot where the fingertips touch the ground, thus repeating the same process all the way around. Some sadhus perform 108 dandavata parikrama by offering 108 obeisances in one spot before moving to the next. This can take a number of months to complete and one has to sleep wherever one is and accept alms from pilgrims passing by.